Fungi found near Weir Hill in North Andover. To the untrained eye, the pile of damp, dead leaves looked nondescript at best, disgusting at worst. But Marsha Browne knew better. She knelt and scraped them aside, exposing a vibrant orange clump of “chicken of the woods,” an edible mushroom that grows in North American hardwood forests. Taking a knife from her basket, Browne stuck it under the mushroom’s root and pried it from the dirt. After examining it closely, she carefully placed the mushroom in a paper bag. At about a day old, critters and bugs hadn’t gotten to it yet. Browne, who discovered a passion for mushroom hunting after retiring from a software company, organizes hunts for fellow fungi lovers nearly every weekend during the summer. She took up the hobby in 2009 because mushroom hunting had been a family activity for her French husband and found that she was uncannily talented at identifying mushrooms. In 2011, Browne joined the Boston Mycological Club, the oldest amateur mycology club in the country. In 2014, she took over a meetup group, Mushroom Lovers USA, through which she organizes the hunts. On a recent Saturday in August, Browne led a group of 20 on a mushroom hunt at Weir Hill in North Andover. At the beginning of the trek, she gave a brief talk about how to hunt for mushrooms responsibly. No identifications until the hunt was over. Only take what you need. Treat the woods respectfully. The group forages for mushrooms from mid to late June through the end of October. The first walk at Fellsway East drew nearly 70 people. Since then, the group has visited Hamilton Woods, Boxford State Forest, and the Winnekenni Castle. According to Browne, up to 10,000 species of mushrooms grow in the area. 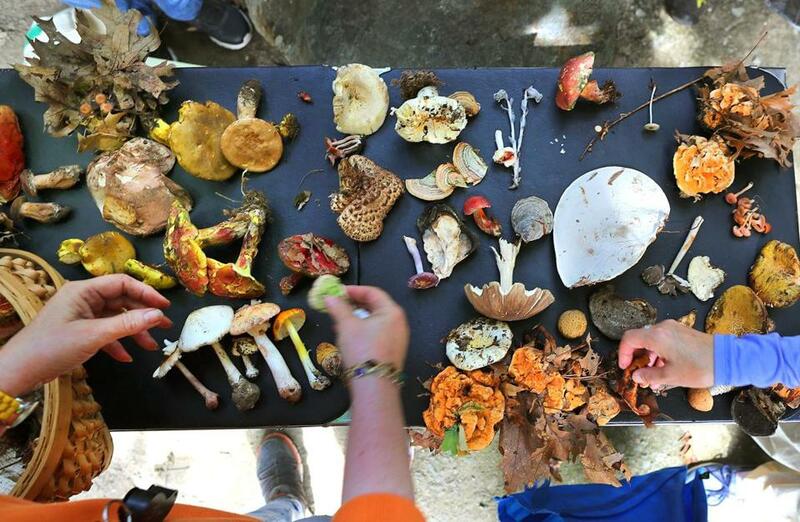 Out of those, only about 50 species are edible, making it extremely important to hunt for mushrooms with someone who is experienced. On this particular walk, the mushroom foragers looked for bicolored boletes, “chicken of the woods,” and chanterelles (no one found any). Leo Goldberg, who works in IT, brought his co-worker, Steven Giglio, on this particular mushroom hunt. Goldberg had been hunting mushrooms for a while and carefully documented the trees around the mushrooms he found on his phone. Giglio, who had never hunted mushrooms before, was happy to tag along. People often think that if birds or squirrels eat a mushroom, it’s safe for human consumption as well, according to Browne. However, because animal digestive systems are very different from human ones, that’s not the case. At the end of the trek, Browne picked up a beautiful white mushroom from the table in front of her. Slender with an unblemished cap, it looked every bit, if not more, edible than the rest of the mushrooms on the table. She identified it as a destroying angel, a deadly mushroom that severely damages the liver and kidneys when consumed. On a walk Browne led a year ago, a young man who was on his first mushroom hunt had found a destroying angel. He told her he wanted to go home and eat it immediately because it was the first mushroom he ever picked, even though Browne said it would kill him. “I told him that if he was set on eating it, that he should leave half of it in the fridge so the EMT would be able to find out what killed him,” she said. Indeed, the line between a delightful, earthy treat and serious stomach pain is a very thin one. Browne said eating a mushroom without being 100 percent sure about its identification is always a terrible idea. Linda Kovitch, a nurse at the Franciscan Children’s Hospital in Brighton, peered at her mushroom haul at the end of the trek. It was her first time hunting for mushrooms, and she had heard about the hobby from a friend in the United Kingdom.